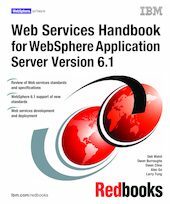 This IBM Redbooks publication describes the concepts of Web services from various perspectives. It presents the major building blocks on which Web services rely. Here, well-defined standards and new concepts are presented and discussed. While these concepts are described as vendor independent, this book also presents the IBM view and illustrates with suitable demonstration applications how Web services can be implemented using IBM WebSphere Application Server 6.1 and IBM WebSphere Application Server Toolkit 6.1. This book is a rewrite of the book WebSphere Version 6 Web Services Handbook Development and Deployment, SG24-6461. The new book covers the latest specifications in regard to Web services and Web services security. Part 1 presents the underlying concepts, architectures, and specifications for the use of Web services. Part 2 shows how Web services can be implemented and deployed using the latest IBM products. Here, we introduce the weather forecast application, which we use in many ways to demonstrate these concepts and features. Part 3 shows some advanced techniques, such as Web services security, interoperability, the service integration bus, and the new support for the specifications WS-Addressing, WS-Resource, WS-BusinessActivity, and WS-Notification.